Happy Monday! How did your weekend go? Did you manage to stay cool and have fun? DH made sure to let me spend my birthday the way I like, which is shopping, swimming with LO, and having a nice dinner. I didn't get to do all the shopping I wanted, but hopefully I'll get a chance soon. I have to prepare for my Nola vacation! 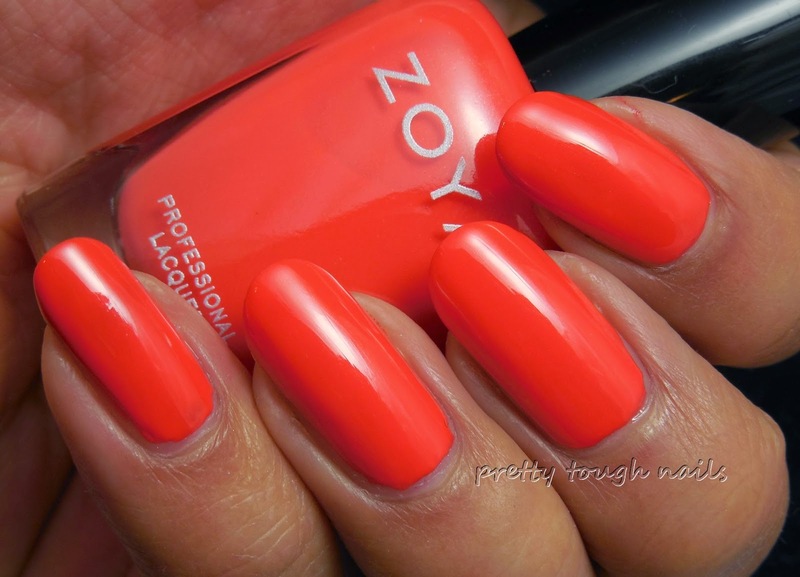 I was fortunate enough to come by a set of Zoya's newest collection for summer, Tickled, which features creams in bold eye catching colors. The formula on all of these were very similar, and surprisingly, verged on a crelly formula. You'll see a bit of squishiness in the finish, and not any of that pesky chalkiness that sometimes happens with lighter colors. Most of these only needed two coats, all except for the lightest shade Kirtridge, which required 3 for full opacity. These are all finished with topcoat to maximize shine. The first is Wendy, a medium pink shade that IMO lands smack in neutral territory. I can't say it leans cool or warm at all, and surprisingly, looks feminine and clean on me. Pinks usually draw at my sallow undertones and I'm happy to report that this doesn't appear to do that. Tilda is probably the favorite of mine in this collection. It's a medium green shade that's got just enough murkiness to border on pretty ugly, but still leans toward a green that is full of life and reminds me of beautiful summer leaves. Rocha was a surprising favorite for me in this collection as well. I didn't anticipate it to be such a bright tangerine orange shade from looking at the bottle, but once on the nail the orange really pops. I don't normally like oranges, but the hint of red takes it out of the pumpkin orange spectrum. Next is Ling, a delightful denim shade that glides on easily with two easy coats. There's been a lot of popular dark blue shades and I'm happy to finally see a blue in the medium range. Lastly is Kirtridge, the lightest shade of the collection. It's a neon baby pink shade that required three coats for opacity. It's so bright, I think it borders on the neon color range. Each and every one of these colors is a lovely addition to the ever expanding rainbow of Zoya lacquers. My favorites of course are Tilda and Rocha, both of which are exceedingly vibrant and unexpected. I can see myself using these colors for summer pedis. If you're looking for some refreshing new colors to add to your collection, head over to Zoya.com and make sure you pick these up! Hopefully you'll like the crelly formula! These are gorgeous shades! I'm especially in love with Wendy, Rocha, and Kitridge. By the way, Happy Belated Birthday! I hope it was a great one!